This DV8 Polyester Just Black bowling ball is perfect for a beginner bowler or for a pro to use as a spare ball. Not only do you get the ball, but DV8 is giving a free shoulder sack that you can use to put your ball and other accessories in. Grab this durable ball today and destroy the pins on the lanes! The ball is great but the bag bottom ripped from the seam. The ball I received has imprints, resembling the texture of a nylon strap, all the way around the ball. Bowling.com says it shouldn't affect the roll of the ball and offered a $20 store credit. I have had the ball resurfaced twice and the imprints can still be seen and felt. The shop says they can't resurface it any more without taking all the graphics off the ball. I do not recommended buying this ball and I do not recommend doing business with Bowling.com. Thanks for the question! 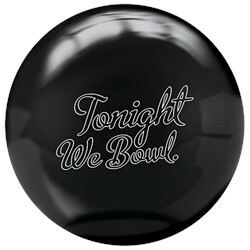 The phrase "Tonight we Bowl" is engraved on this bowling ball. Do you have a DV8 Just Black in a 13lb 5 or 6oz? Hi Ruben. You can request for a certain weight in the blue box where it says "click to request pin/top weight". It is a plastic ball, and will not have a weight block. Due to the time it takes to produce the DV8 Polyester Just Black with Free Bag ball it will ship in immediately. We cannot ship this ball outside the United States.